, an English divine of good abilities, was born at Colchester, Sept. 27, 1717 admitted of St. John’s college, Cambridge, in 1734 and, having taken the degree of bachelor of arts in 1739, elected fellow of it in March 1740. In 1741, he was taken into the family of lord Townshend, as private tutor to his second son Charles Townshend, afterwards chancellor of the exchequer; and was ordained deacon and priest at the end of the year, when he was instituted to the rectory of Colkirk in Norfolk, on lord Townshend’s presentation. 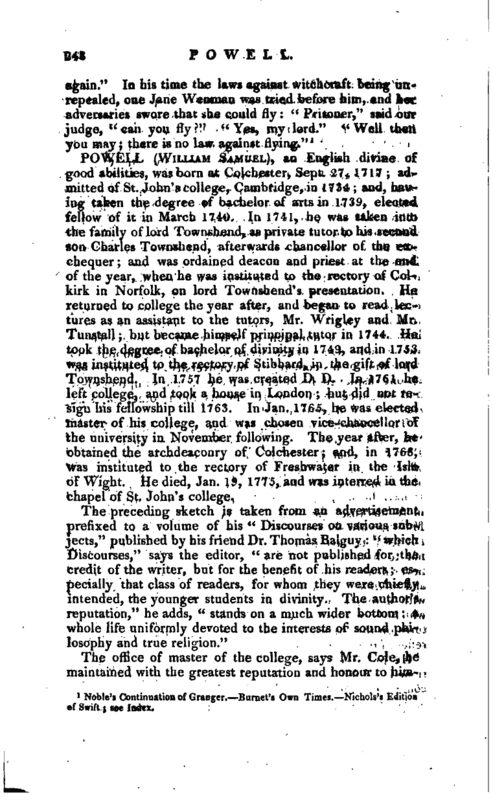 He returned to college the year after, and began to read lectures as an assistant to the tutors, Mr. Wrigley and Mr. Tunstali but became himself principal tutor in 1744. He took the degree of bachelor of divinity in 1749, and in 1753 was instituted to the rectory of Stibbard, in the gift of lord Townshend. In 1757 he was created D. D. In 1761 he left college, and took a house in London but did not resign his fellowship till 1763. In Jan. 1765,‘ he was elected master of his college, and was chosen vice-chancellor of the university in November following. The year after, he obtained the archdeaconry of Colchester; and, in 1768, was instituted to the rectory of Freshwater in the Isle of Wight. He died, Jan. 19, 1775, and was interred in the chapel of St. John’s college. 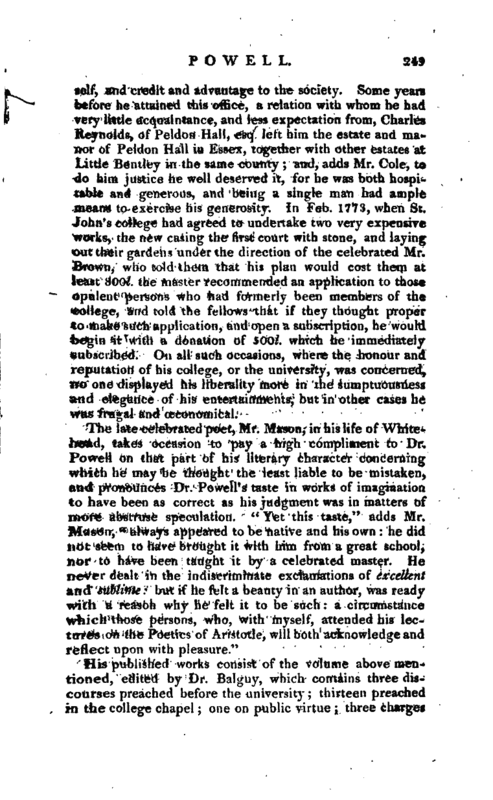 The office of master of the college, says Mr. Cole, he maintained with the greatest reputation and honour to | himself, and credit and advantage to the society. Some years before he attained this office, a relation with whom he had very little acquaintance, and less expectation from, Charles Reynolds, of Peldon Hall, esq. left him the estate and manor of Peldon Hall in Essex, together with other estates at Little Bentley in the same county and, adds Mr. Cole, to do him justice he well deserved it, for he was both hospitable and generous, and being a single man had ample means to exercise his generosity. In Feb. 1773, when St. John’s college had agreed to undertake two very expensive works, the new casing the first court with stone, and laying out their gardens under the direction of the celebrated Mr. Brown, who told them that his plan would cost them at least 800l. the master recommended an application to those opulent persons who had formerly been members of the college, and told the fellows that if they thought proper to make such application, and open a subscription, he would begin it with a donation of 500l. which he immediately subscribed. On all such occasions, where the honour and reputation of his college, or the university, was concerned, no one displayed his liberality more in the sumptuousness and elegance of his entertainments, but in other cases he was frugal and ceconomical. His published works consist of the volume above mentioned, edited by Dr. Balguy, which contains three discourses preached before the university; thirteen preached in the college chapel one on public virtue three charges | to the clergy of the archdeaconry of Colchester and his “Disputatio” on taking his doctor’s degree. 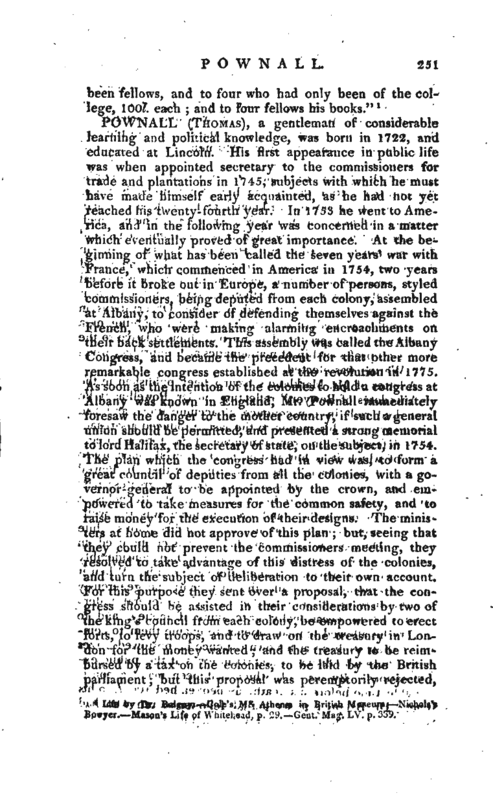 One of his discourses, relative to subscription, was first preached on commencement Sunday in 1757; and being reprinted in 1772, when an application to parliament on the matter of subscription was in agitation, was attempted to be answered, probably by the author of the “Confessional,” in a pamphlet entitled “Remarks on the Rev. Dr. Powell’s Sermon, &c.” but of this we do not know that he took any notice, Contenting himself with this reprint of his sermon, which was the fourth edition. He had spoken his sentiments, and had no turn for controversy. He acted the same part in his college; during the controversy in 1772 he called all his scholars before him, and submitted to them the real state of the case relating to their subscription, and left it with them. 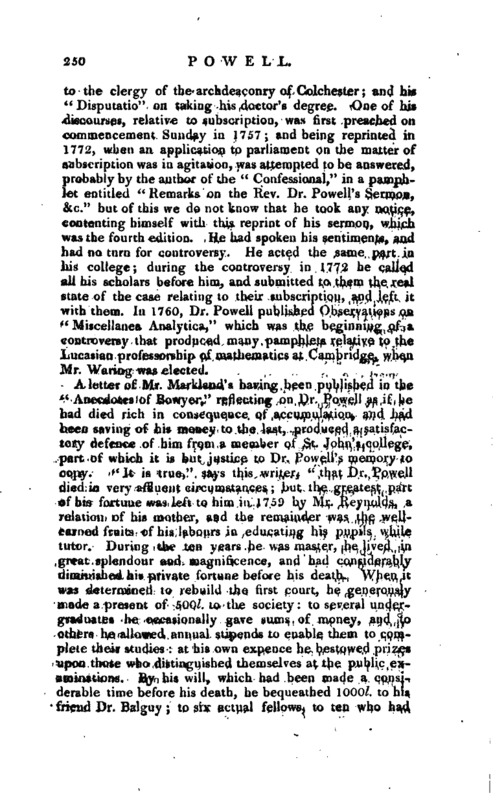 In 1760, Dr. Powell published Observations on “Miscellanea Analytica,” which was the beginning of a controversy that produced many pamphlets relative to the Lucasian professorship of mathematics at Cambridge, when Mr. Waring was elected. 1 Life by Dr. Balguy. Cole’s ms Athenae in British Museum. Nichols’s Bowyer 'Mason’s Life of Whitehead, p. 29. —Gent. Mag. LV. p. 339.